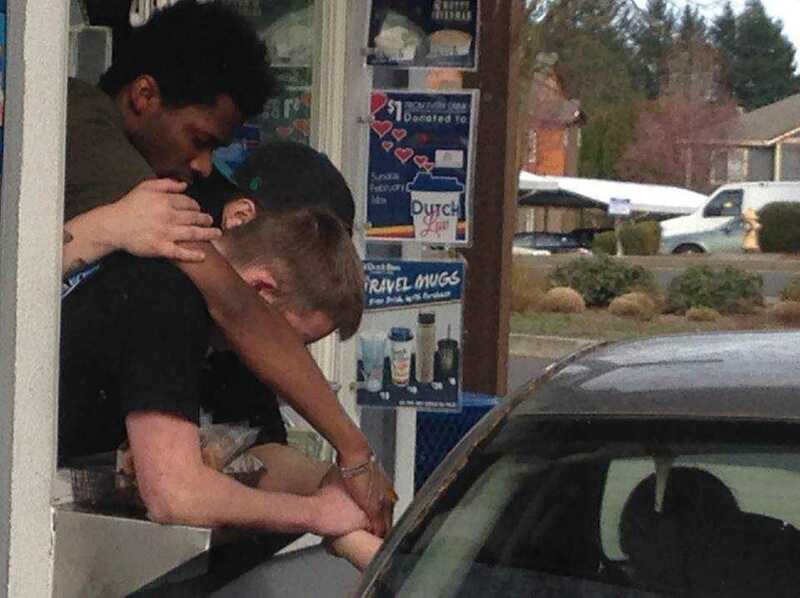 VANCOUVER, Wash. — Several employees at a coffee franchise location in Washington recently took time to pray with a customer who was grieving over the loss of her husband, and the photo of the young men gathering to do so has now gone viral. According to reports, the woman, who has not yet been identified, pulled up to the drive-through window at Dutch Bros. in Vancouver on Saturday, and was visibly distraught. Her 37-year-old husband had died the night before. Pierce Dunn, 19, who identifies as a Christian and was working with the window, gave the woman free coffee and asked if he could pray for her. He told his co-workers that the woman was hurting from the loss of her husband. Dunn’s co-workers Evan Freeman, 21, and Jacob Hancock (age not known) soon came to the window as well, and three leaned out the window, stretched out their hands and prayed for the woman. Dunn said he prayed that God would give the widow peace and that she would feel the support and love of others. A woman named Barbara Danner, who was waiting behind the widow at the drive through, saw the workers praying through the window and snapped a photograph. She later posted it to social media. “When the DB guys & gals noticed she was falling apart, they stopped everything and prayed with her for several minutes, invited her to come back for prayer and support, as well as anything else that she might need,” she outlined. The photo has since received over 434,000 likes and over 133,000 shares. Hancock also shared the photo to his Instragram page and received over 405,000 likes and 122,000 shares. Freeman told reporters that he is not “religious,” but didn’t mind praying for the woman. Dutch Bros. has nearly 200 locations in Oregon, California, Washington, Idaho, Nevada, Colorado and Arizona.